Since the first Night Moves race last June, 205 runners have participated, many of who have run multiple races. As we progress farther into the 2016 Night Moves series, I thought it best to take a step back and evaluate the progress. In doing this, we can see the strengths and weaknesses in order to ultimately determine how we can improve the events overall. In 2015, we had a series of four races planned during the summer and ended up adding two pop-up races in November and December. As can be seen on the chart, the most popular races were the last three: July 17, November 20, and December 11. Not only were they the most popular, they attracted 62% of the total turnout for all the races combined. With this information, we have to question why these were the most attended races of the season. We can tentatively conclude that Night Moves gained momentum as the word got out and more people began inviting friends and family to participate. After seeing how many people participated in our events, the next question we asked was, who are they? Out of the 181 participants in 2015, over 55% of them were women. When we looked at each race individually, we found that there were more women than men in 4 out of the 6 races in 2015. Nonetheless, the numbers were high on both ends and, since we capped most of the races at 40 runners, we were thrilled after evaluating the overall turnout. How many people came back? Even though there were 19 more women than men that participated in 2015, we found that men were more likely to run multiple races. During the six race series, 69 of the 100 females ran only one race. Only 5% of the female runners ran more than 3 races. On the other hand, 46 of the 81 men (about 57%) ran only one race, while about 14% of the male runners ran more than 3 races. This has caused us to ask questions such as, how do we encourage our participants to run more than one race? How can we add unique value to each individual race? As we move forward into 2016, we evaluated the first three races of each year to see how they compare. 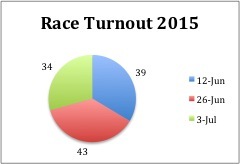 We have found that the first three races in 2015 all had a higher turnout than the first three races of 2016. As a result, we have concluded that registration numbers have slightly decreased into the beginning of this series. There could be a number of reasons for this such as, the 2016 series began earlier in the summer and it has 9 races instead of 6. We are hoping numbers will steadily increase as the series continues like they did in 2015, but we are still pleased with the turnout thus far. All of our Night Moves races have been profitable and have greatly benefitted NeighborLink Fort Wayne projects (for more information see the Impact page). However, this information begs the question, what can we do to add unique value to each individual race? If you have run a Night Moves, we would love to hear what you think. What would you like to see at future Night Moves races?